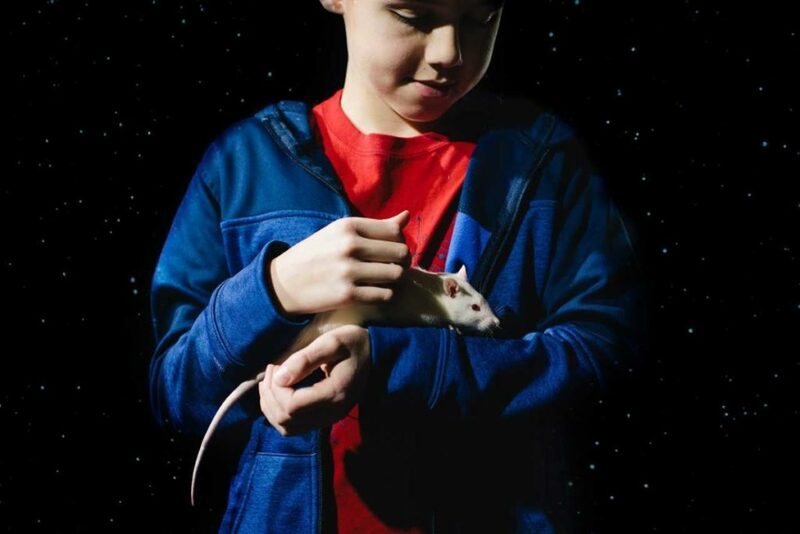 Omaha, NE—Tonight, the Omaha Community Playhouse opens The Curious Incident of the Dog in the Night-Time, based on the acclaimed novel of the same name by Mark Haddon. In this mystery, Christopher, a 15-year-old boy takes it upon himself to solve the murder of his neighbor’s dog. Director, Kimberly Faith Hickman’s production of Curious incident embraces many on-stage challenges to bring the story life. Live animals are part of the cast, a pet rat from Arbor Park Intermediate School, and a dog, Peter Frampton. The stage is raked, meaning it’s tilted toward the audience, giving a slightly different perspective on characters and scenery. Audiences can also expect some physical theater. Another challenge for the show’s lead, played by Dominic Torres, is the treatment of autism on stage. Hickman, though, was able to draw on some of her own experiences while directing. A major supporter of the Playhouse’s Curious Incident is CHI Health. Medical staff have been following the production, and an art installation will be on display in the lobby of the theater—60 paper lamps painted to represent moments in the show made by patients of CHI’s Psychiatric Treatment facility, and various paintings and sculptures from Why Arts.